THEY POPPED UP QUIETLY, SHORTLY AFTER THE 2016 PRESIDENTIAL ELECTION: THE SIGNS. A new group of signs that appeared as the campaign signs came down. Poster board with printed words that reminded us that we are a community,not only locally, but globally. 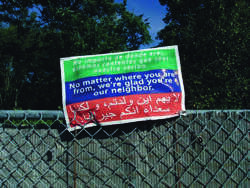 The first sign I noticed was the tri-colored, “No matter where you’re from, we’re glad you’re our neighbor”. A simple, powerful statement written in English, Arabic and Spanish. Once I noticed the first, I started to look for them – and there they were, all around town. That sign and others that expressed beliefs that support our freedoms and human rights for all. 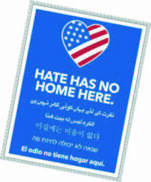 She tried to get a “Hate Has No Home Here” sign, but it was back-ordered. Not one to sit and wait around for someone else to solve her problem, Sarah went online and found a web site (signsonthecheap.com) that allows you to create and print your own signs. She came up with a similar design and decided to print in bulk. She would make 100 signs and offer them to others, for free. 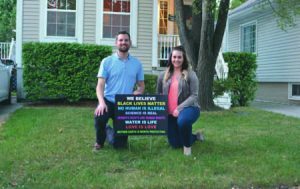 “I wanted to spread a little bit of hope around the community.” A co-worker told her she was crazy: No one would want the signs. And what would Brian say? Sarah posted on the Facebook Ferndale Forum, and the response was overwhelming. And although Sarah offered the signs for free, the community was all too happy to help finance the project. One person sent $200 dollars to help. Another person who contributed money doesn’t even live in Ferndale anymore, but liked the project enough to support it. By the time the signs came in, Sarah had a spreadsheet with 300 names on it, people waiting for signs. The night she set out to deliver the first batch, Brian was with her all the way. It turned out to be quite an adventure. He smiles, remembering that first delivery outing. “It was fun. We got to learn a lot about the town.” They both mention “admiring their neighbors’ houses, the front yard gardens”. Brian said the best part was “us working together and meeting our neighbors face-to-face.” They loved the chance to get to know more about their adopted home town. People were friendly, inviting them in and sharing their Ferndale knowledge with them. Like a light in the window. 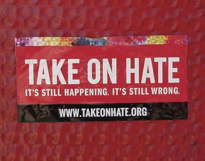 Signs of hope in Ferndale.